One of the best parts about this day and age is that you always have choices. For instance, you probably have hundreds of channels on your television, and an infinite amount of options online. This breadth of choice also applies to replacing your missing teeth. You’ve heard of both dentures and dental implants in Ocala, FL, and how they are both viable solutions, but which one would work best for you? Today, Dr. Daniel Weldon is going to tell you a little more about how you can effectively replace your missing teeth. Generations of people have used dentures in Ocala, FL to bring back their smile. 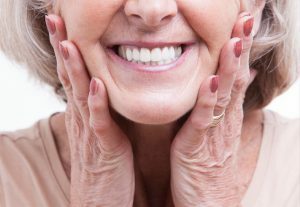 Dentures, in one iteration or another, have been used for a very long time, and modern-day dentures are stronger, more comfortable, and more natural looking than ever. Dentures are composed of prosthetic teeth attached to an acrylic, gum colored base. They can be used to replace a portion or an entire set of teeth. They typically take a few weeks to get, and are held in place by natural suction, metal clamps, or dental adhesive. Dental implants are one of the most comprehensive ways to replace your missing teeth. They are different than any other restorative procedure because they replicate your tooth both above and below the gum line. A small titanium post is placed into your jaw to act as a new tooth root. This root is then topped by a porcelain crown. Dental implants can be used in a variety of ways, as they can replace a single tooth, anchor a bridge, or even support a set of dentures. Either of these approaches are great for restoring your smile, and each one has key advantages. Dentures are one of the fastest ways to replace a large amount of missing teeth because they typically require very little prep from the patient compared to dental implants. They can give a person a completely new smile in a matter of weeks. They are easy to maintain, and just need to be brushed and soaked daily. They are also highly customizable, enabling a person to get the exact look and fit they want. The big difference when compared to dental implants is that the fit will not stay consistent forever, and they will need to be replaced about every 5 years. Dental implants have the advantage of being able to prevent and even reverse the tissue loss common after tooth loss. The titanium is bio-compatible, meaning that after it has been placed, the body will naturally send more blood to the area, revitalizing the gums and jaw. This helps them provide the most consistent and longest lasting solution of any restorative procedure, and only need to be brushed and flossed daily to last for decades. They take longer to get than dentures and require minor surgery, but the results are much more consistent over time. The only limiting factor is that a patient needs enough healthy jawbone to support them. If they do not, dentures may be a better option. The only way to figure out which solution is best for you is to visit your dentist in Ocala, FL. This will give Dr. Weldon the chance to examine your mouth and gums in order to help you choose the right treatment. Unlike many practices, he can complete either one himself, so you know you’ll always be taken care of from beginning to end. If you have more questions about dentures, dental implants, or which one is right for your smile, please give us a call today.